Pokemon Gastronomy? Pizzatora? Lomegg? Tacocolo? This is a potato. This is random. I don't know why I made this. This is a test of the tiles i'm working on, just to see how they would pan out when/if mapped. I do know the mountain ground tiles are different colors, it's to specify where you can find pokemon, any suggestions on a transition? That's a really neat color scheme you've got there! Maybe something like the edge of a mud puddle could work as a transition? This is a water and psychic type female Meowstic I made. I'd like to get some feedback to improve upon it or know if it's fine as is. The meowstic looks really good, the colors kinda remind me of shiny regular meowstic. The dress thingy thats made out of scales looks beautiful. The only thing I can think of to improve is the size of the tiara because its hard to see, but you dont need to. I think you need to redo the orientation of your shading. Your sprite looks very flat at points and very bubbly at points. Your Color scheme is very bright as well. Maybe tone down the saturation a tad. 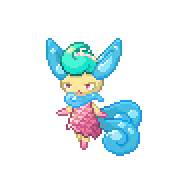 Also, you have no outlines, which can be a love/hate sort of thing but the overall build of the sprite looks great. First draft of my fakemon dex. What do you think? Figured I'd throw these back out and see what people who aren't on the discord think. So this is my Pikaflame or Flamepika, its my first time spriting and I ceated a Firetype Pikachu! Some test stuff to try and get back into actual pixel art. I assume the object on the bottom right is a badge or Keystone? Anyways, interesting mons despite I'm curious of the difference between the top two and what the mon on the bottom left is. I'm curious on their names, types, and inspiration. But anyways! I think you definitely are having a great start to going back to spriting. Ah, thanks! Unfortunately, they're not actual fakemon, just some stuff I scribbled up on the spot to work with. It's just this, and some lighting on the fin of the left one. I've recently been working on reformatting and improving some 5th gen styled 7th gen overworld sprites. I've never actually worked with pixel art before and I usually stray away from it, but I decided to work on these. 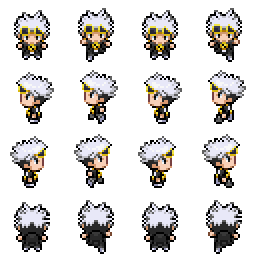 I've finished two so far, Guzma and the female (although it could also work as a male) Aether Foundation employee. 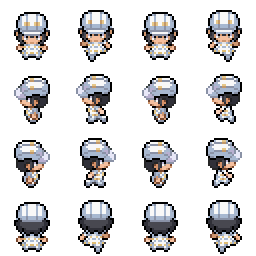 The original 5th gen sprite for the Aether Employee and for ya boi Guzma. Darn, that's nice! I love them, great work! yall mind if i praise this fake leak?